This Valentine’s Day, you may be looking forward to hearts and flowers from a new love interest or a long-awaited date with your spouse. You certainly won’t expect someone you care about committing fraud using your identity. Unfortunately, familiar fraud is all too common. More than 1 million children experience identity theft annually, and two-thirds know the perpetrators. Seniors, college students, spouses, significant others and online daters are also targeted. Familiar identity fraud: A friend or family member applies for loans or credit cards using your personal information. Victims who are children or college students, often do not learn of the fraud until years later. They begin their adult lives with poor credit, which can hinder finding a place to rent, getting a loan and even landing a job. Catfishing: In potentially dangerous situation, you aren’t dating who you think you’re dating online. Catfishing occurs when someone sets up a too-good-to-be-true online persona (often by stealing someone else’s identity) to attract romantic partners. Sometimes it’s done as a prank, but often, it is leading toward some type of fraud once the catfish earns your trust. Romance scams: You’ve met your perfect match, and you are ready to meet in person. There’s just one problem—he or she needs you to send money for travel expenses. In a typical romance scam, you are swept off your feet by skillful online seduction, often by a catfish. Requests for money quickly follow. Funds usually can’t be recovered, and Americans lost more than $230 billion to romance scams in 2016. Children under the age of eight are particularly susceptible to familiar fraud, according to Javelin Strategy & Research. Child identity theft—usually familiar—racked up $2.6 billion USD in theft losses last year. College students are four times more likely to suffer familiar fraud than all other consumer groups. Not only do they have to watch out for relatives stealing their identity, but also college roommates and other unscrupulous friends. Seniors are primary targets for romance scammers, since many spend a lot of time alone. By 2030, nearly 20 percent of all Americans will be older than 65. Seniors lose an estimated $6.7 billion each year to people they trust and another $12.8 billion to other types of fraud. Spouses or significant others usually have access to a lot of personal information about each other, setting up a ripe environment for familiar fraud. Sometimes spouses use familiar identity fraud to obtain loans in an effort to cover up some type of financial mistake or mismanagement. Other motivations can be more nefarious and aimed at hurting the spouse financially, especially during the process of divorce. Use strong passwords and password protect computers and mobile devices. If you have trouble keeping track of passwords, consider a password generation and storage tool. Always keep passwords and PIN numbers private—even from friends and family. Share minimal personal information on online dating sites. Set social media privacy options to conservative levels. If you have young children, ask the credit bureaus whether a credit file exists for your child. If yes, place a credit freeze on the file and start to remediate any fraud. Take off your heart-shaped goggles and trust your gut. If a new love interest seems too good to be true, do more research. Don’t send money to online dating interests for any reason. Only logon to your online dating apps on private computing devices over secure Wi-Fi. List a fake birthday on nonofficial sites such as social media and online dating. Pick one you can easily remember that is close to your birthday, but a little different. Obtain a credit and identity monitoring service to stay vigilant against familiar fraud and other financial identity theft. See our infographic on how to protect yourself from familiar fraud here. “How Identity Crooks Can Steal Your Child’s Good Name,” HeraldNet, May 1, 2018, https://www.heraldnet.com/business/how-identity-crooks-can-steal-your-childs-good-name/. “FBI Cautions Public to be Wary of Online Romance Scams,” Federal Bureau of Investigation, Feb. 7, 2018, https://www.fbi.gov/contact-us/field-offices/washingtondc/news/press-releases/fbi-cautions-public-to-be-wary-of-online-romance-scams. “2015 Identity Fraud: Protecting Vulnerable Populations,” Javelin Strategy & Research, 2015. 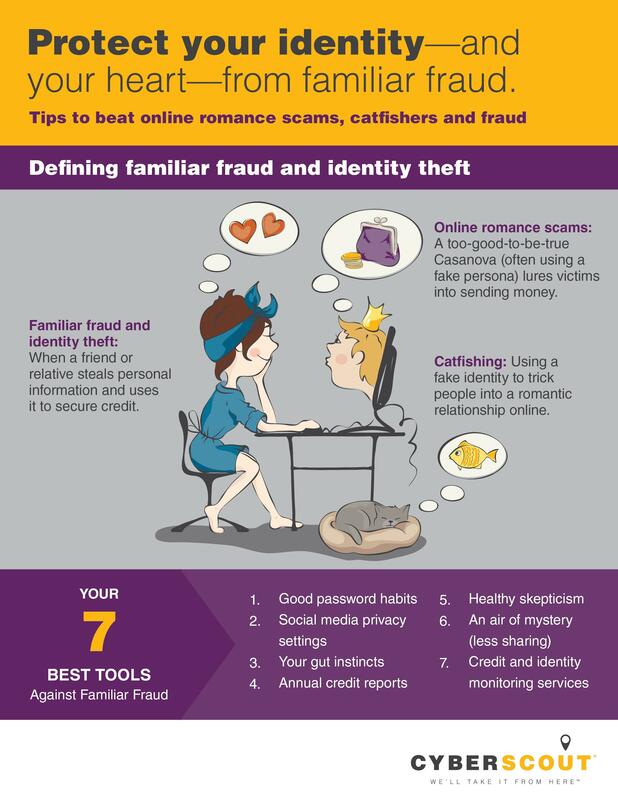 “Online Dating Scams: More Than Just Your Heart Is at Risk,” Experian, January 29, 2018. “The Next Four Decades: The Older Population in the United States 2010 – 2015,” US Census Bureau, 2010. “Senior Scams: Here’s How to Protect Yourself and Your Loved Ones,” Experian, November 22, 2017.